WOW!! 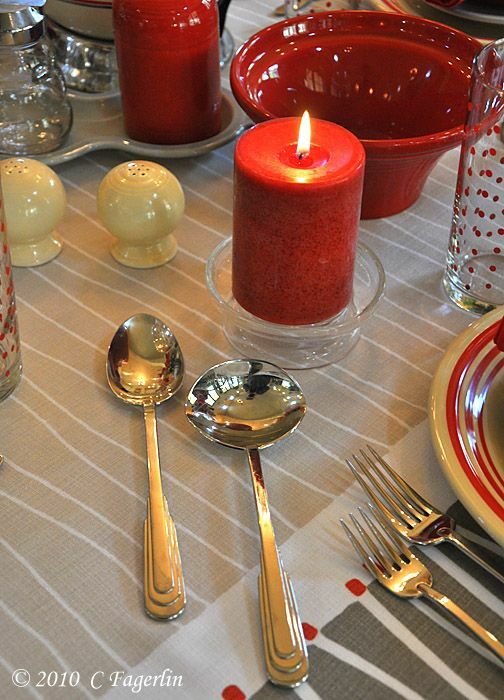 It 's time for Tablescape Thursday again! Join our hostess Susan over at Between Naps On The Porch. Seems so soon after a long holiday weekend and a shortened week this time around. the roses are 'Altissimo' an old time climber. Homer Laughlin "Apple Tree" bowl in Ivory. exclusive piece for a department store, but is now available via many sources. the Presentation Bowl and Millennium Candle Holders. 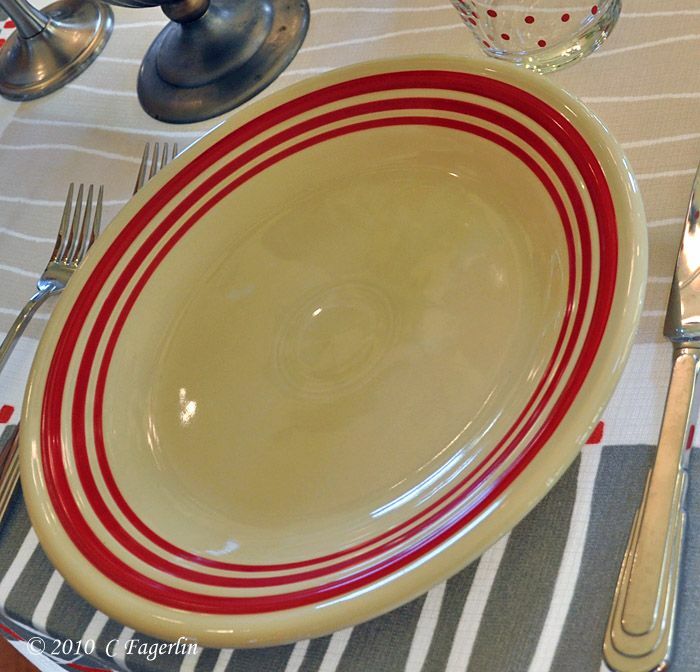 Thanks for coming by for another Tablescape Thursday! so check that out too! I love your tablescape. Polka dot glasses are very clever. I do always love your tables! Love the dots before my eyes mixed with the stripes. 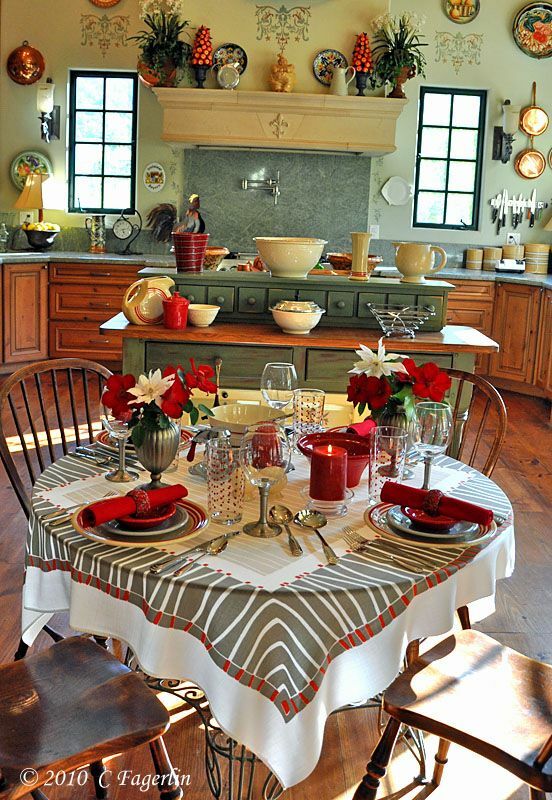 -- colors are, as always, wonderful -- and you know I covet you beautiful tablecloth collection! 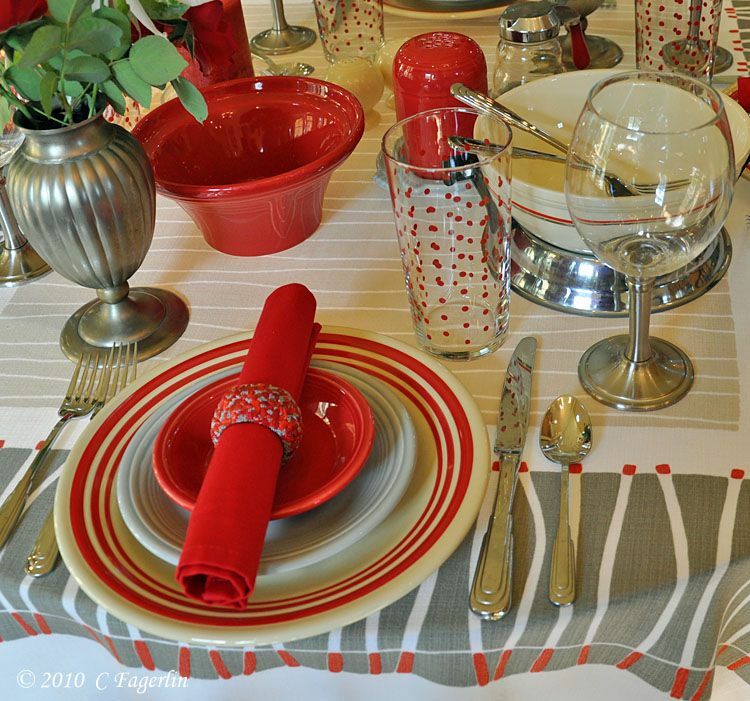 I love this Red and gray together, it is stunning! When I first opened your page I thought the white flower might be a poinsetta. It is a lovely flower and I will have to look into finding myself one. You always have the prettiest tables and such interesting pieces. 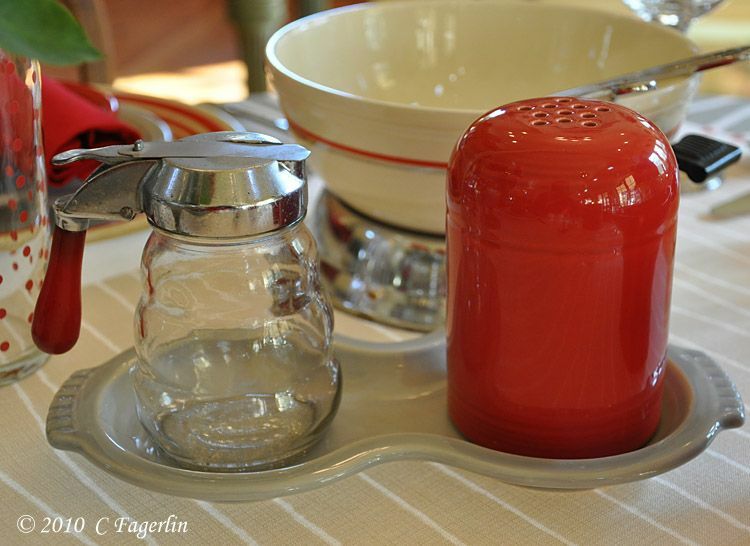 Thank you so much for all the work you do to provide such a lovely, neat and clear table setting. Your photography is excellent. 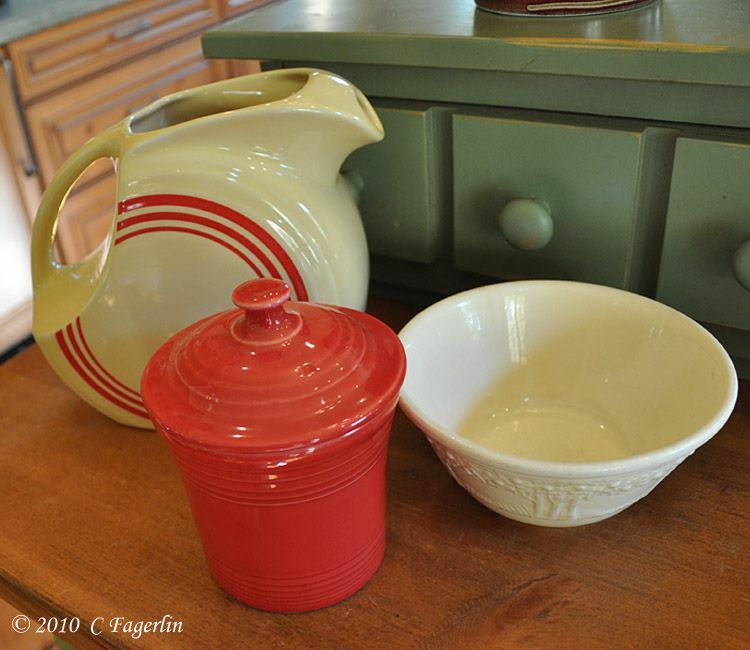 Scarlet, gray, ivory...oh la la! This table contains so many of my favorite things! I especially love the double vases and the way they accentuate the stemware. 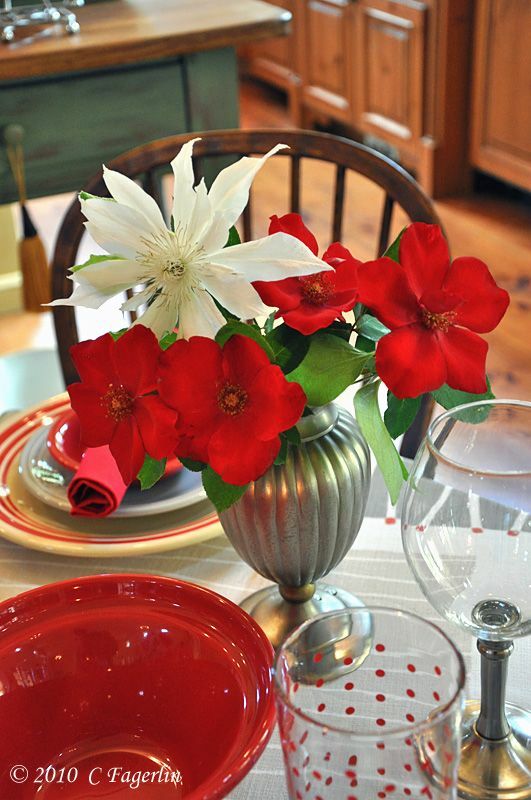 I love the bright red against the gray and cream. It really pops. 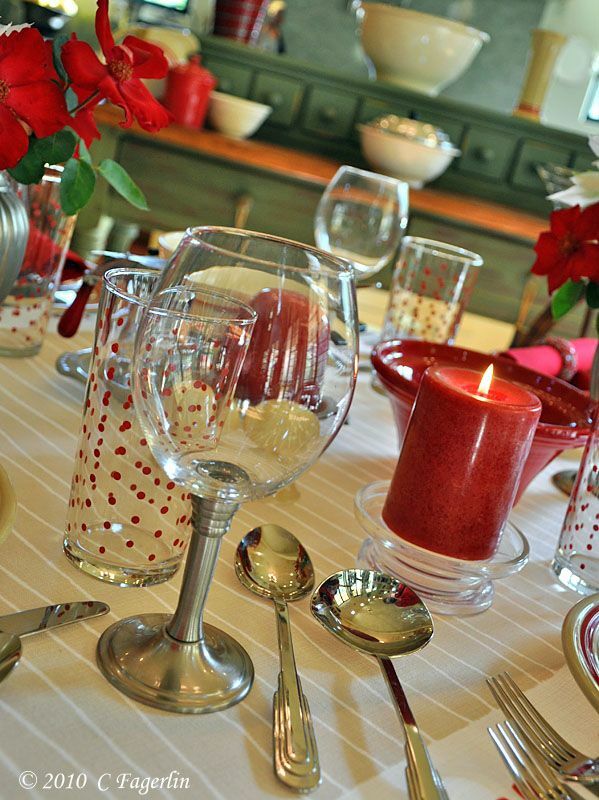 Always look forward to your tablescapes! Thanks everyone, I really enjoyed putting this one together! Pretty different than many of my vintage tablecloths, would love to get an ID on the maker of this cloth. I have received some emails about the comment form not working last night ..... and here I thought it just wasn't appealing! I've reset the "posting" time so hopefully the problem is solved. Thank you Jaybird and Anony! What a lovely table. 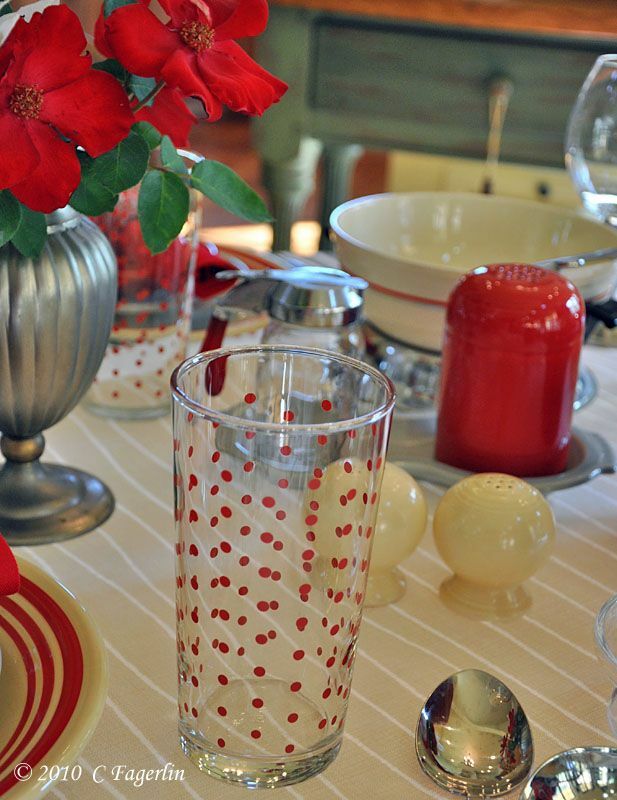 I love your flowers - gorgeous; your linen - lovely; your dinnerware - so cheerful; (gotta love the polka dots); your accessories, awesome! 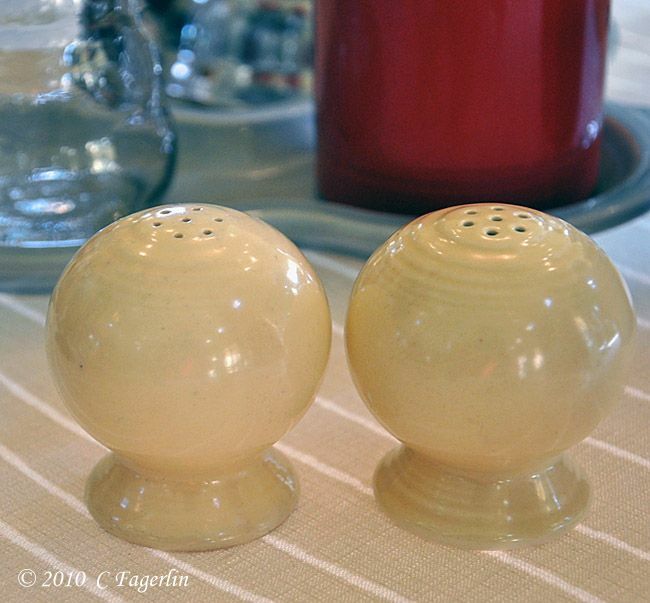 I appreciate the information you provide on your dishes and learning about the special pieces in your collection. Your kitchen in the background is pretty amazing, too! Your flowers are so beautiful! I am envious. Mine are not happy after a long, hot summer. As always, I love your tablecloth. I don't know what I was thinking by not picking up those tumblers at Target. 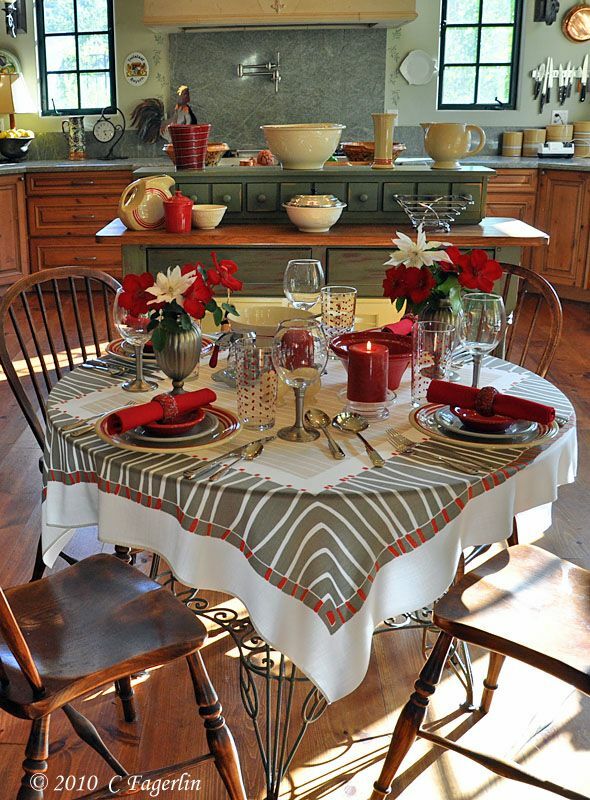 That certainly is a beautiful tablecloth! Though I must confess that, as this is my first visit to your kitchen, I might have missed the finer details because I am in such awe of your kitchen! An incredible space, and you've done it up so nicely. I LOVE what you've done on the... mantle?... on the range hood- great use of the vertical space! 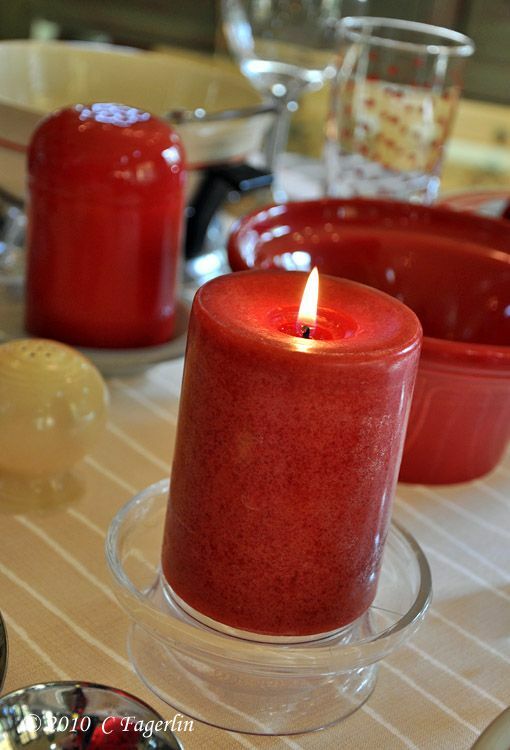 Thank you all for coming by to see my latest tablescape and for your lovely comments. 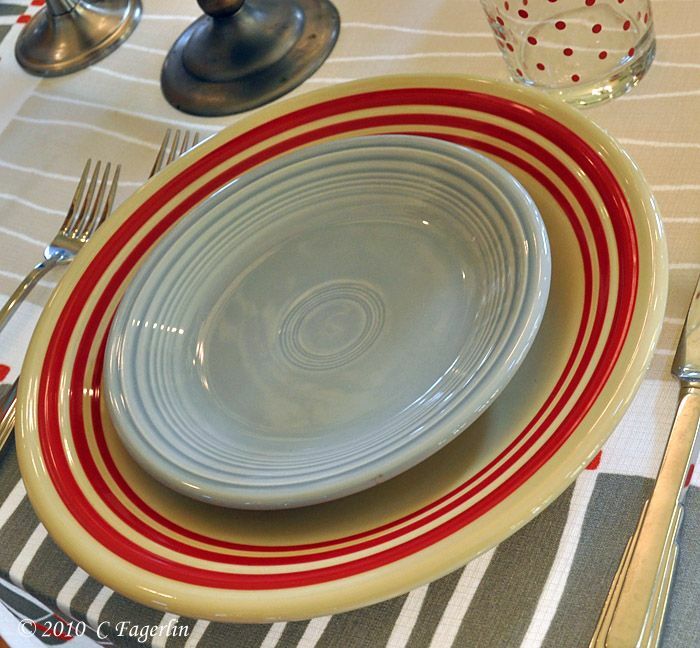 It's just another way for me to use some of my favorite Red Stripe Fiesta! Candy, this is such a lovely, sophisticated color scheme! 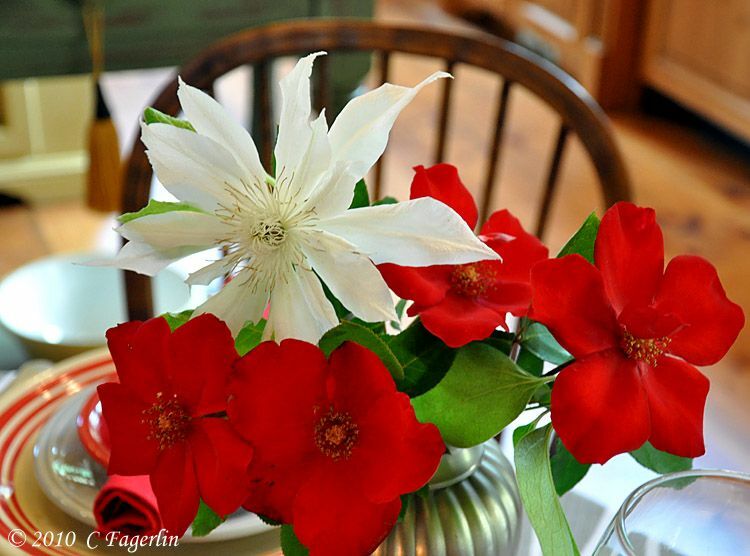 That tablecloth is stunning, and you've shown it -- and those glorious clematis -- to perfection with the red and gray tableware. 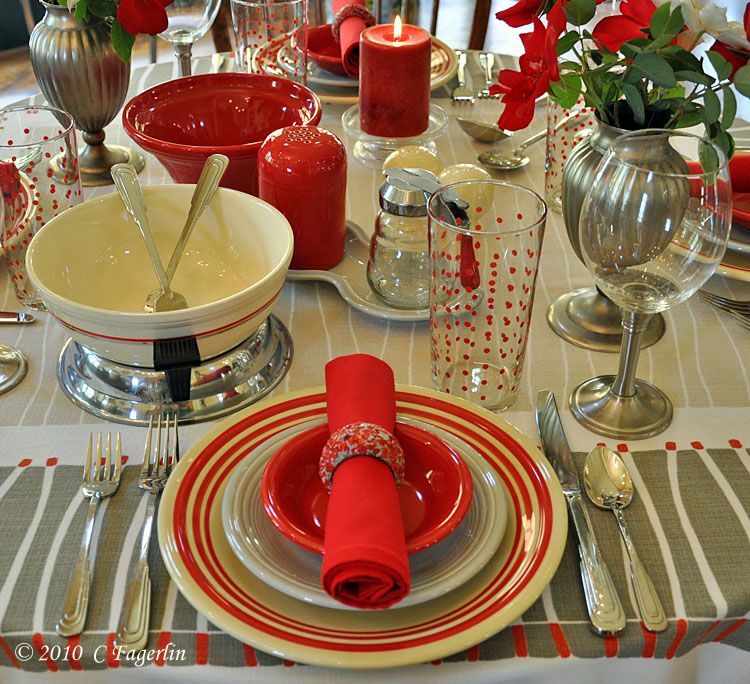 Candy, This is one of my very favorite of all your tablescapes! 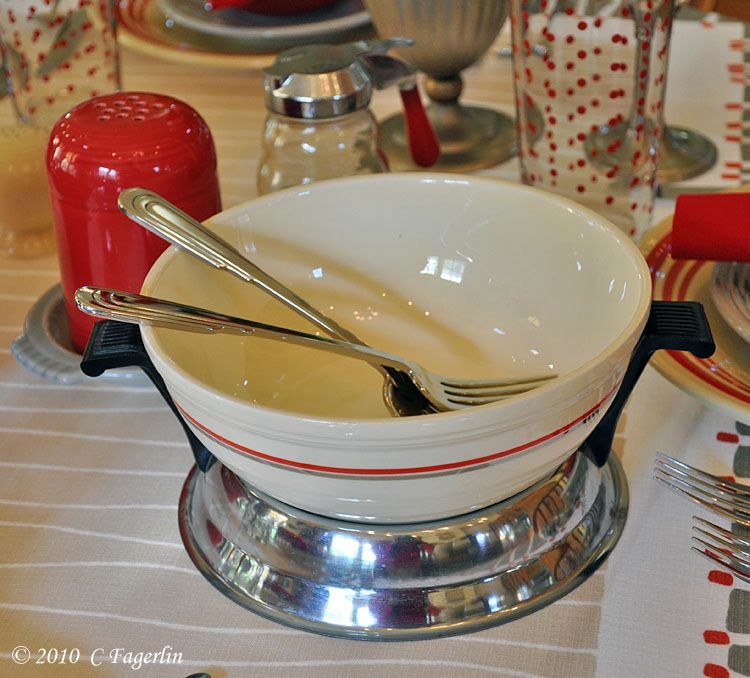 I LOVE the napkin rings...are they a recent find? 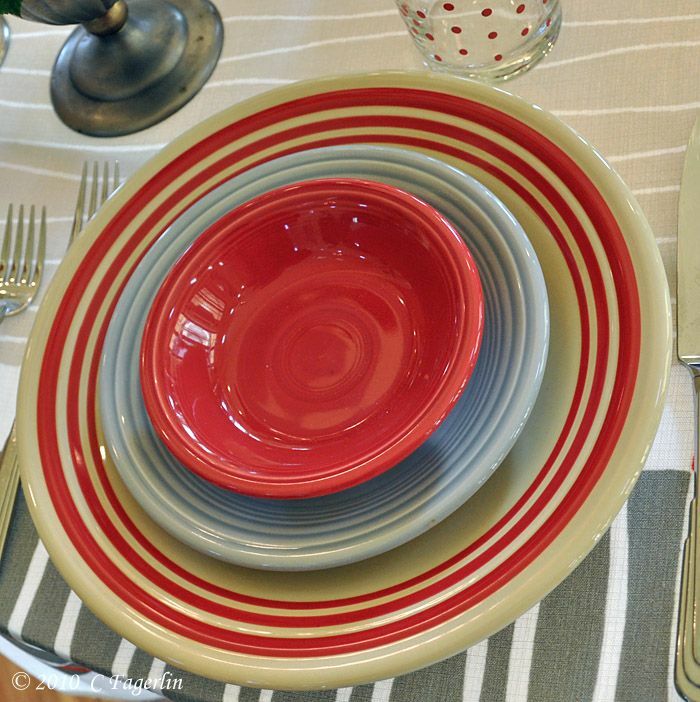 The colors in the tablecloth are gorgeous and go so beautifully with the flowers and your dishes. 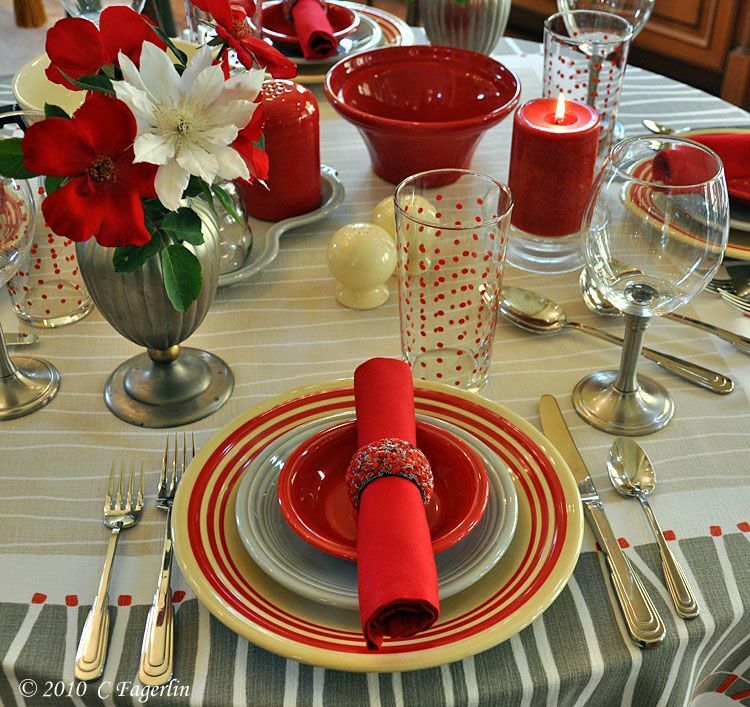 LOVE, LOVE, LOVE, but then I LOVE all your tablescapes! Have a great weekend. Dramatic Heading! I will never forget that day or the day Kennedy was shot! 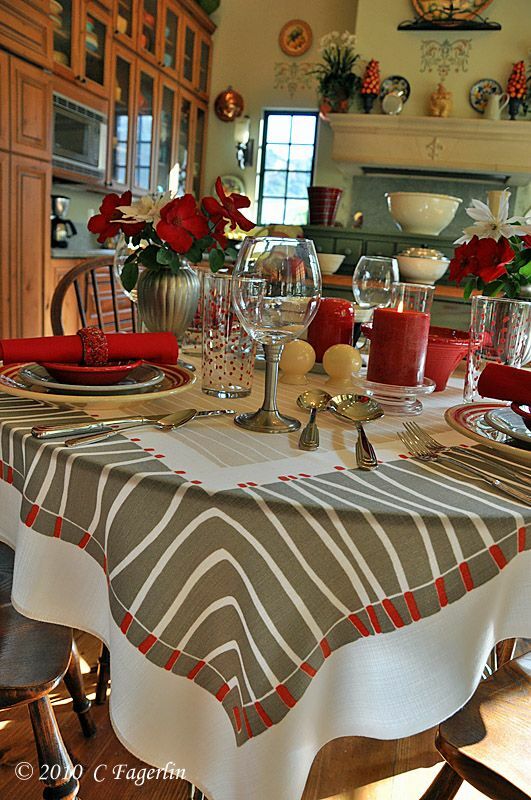 Your tablescape is so special with the lovely colors of the tablecloth. 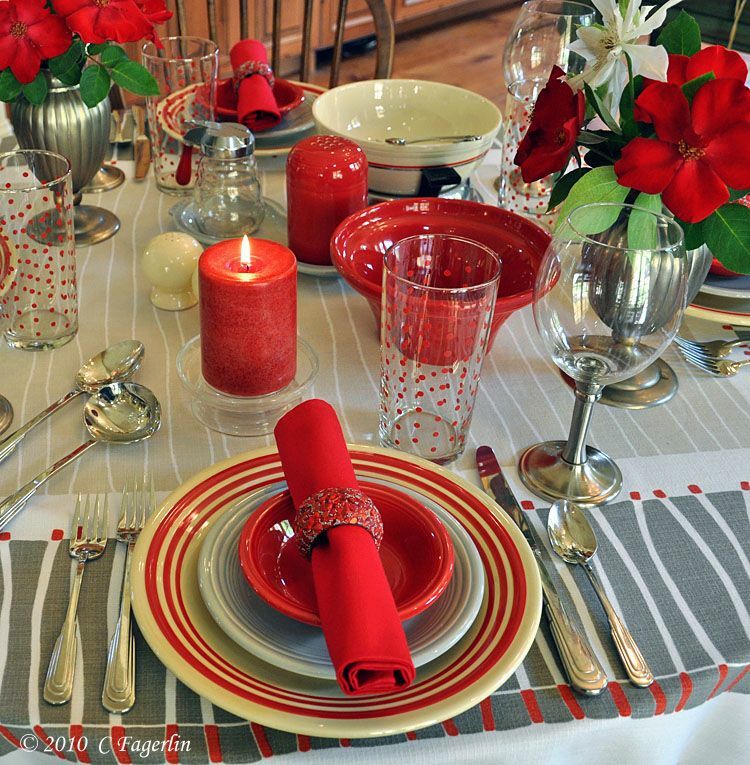 I viewed all the details of the red and white tablescape. 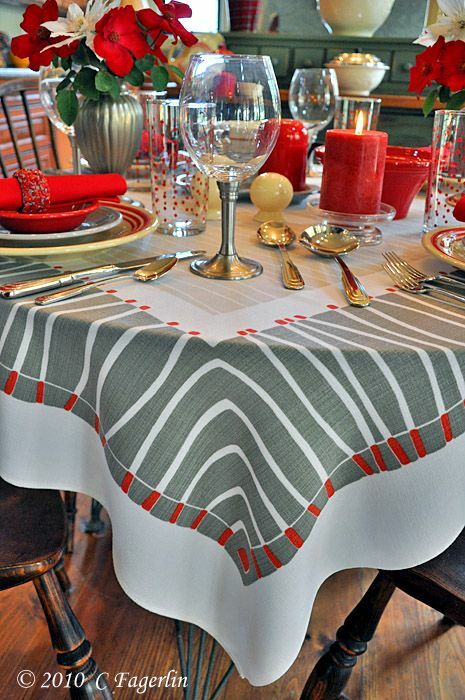 Thanks everyone....this is a new addition to my tablecloth collection and I'm loving it! 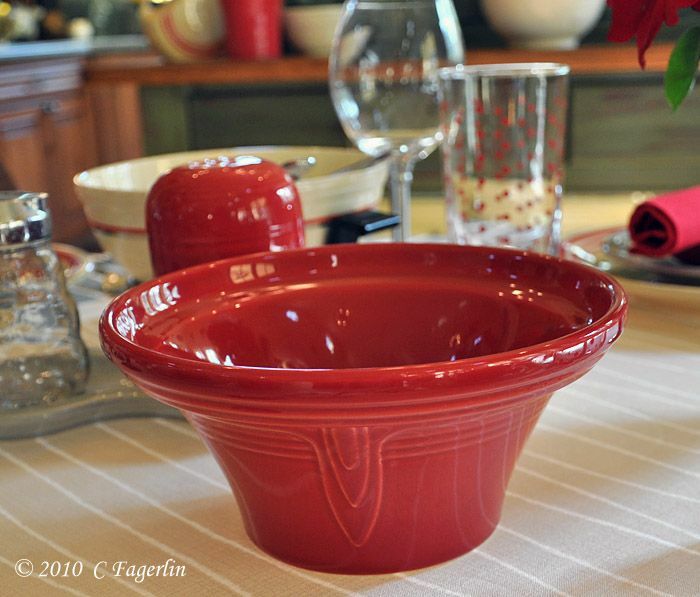 Sheila, that bowl is Homer Laughlin and fairly easy to find at fleas, markets, etc. 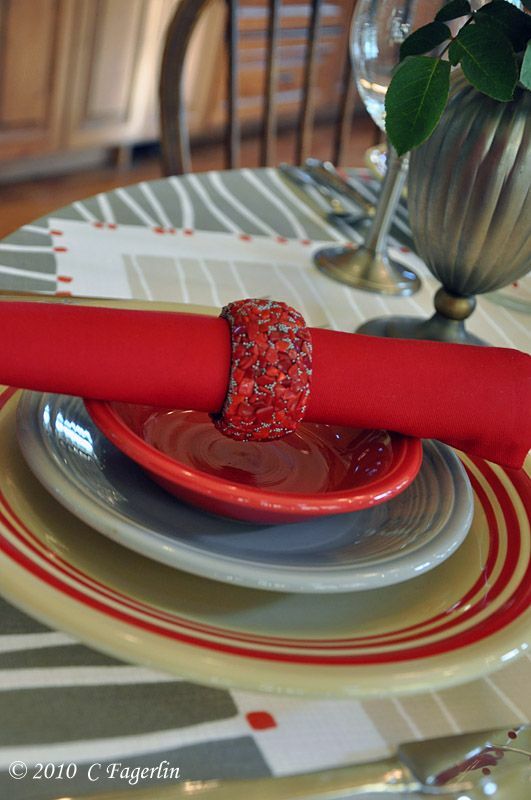 Susan, I've had those napkin rings for several years ..... on sale at Bed, Bath Beyond for $1 each! Texas Tea - Welcome! Glad you like the header, it changes once a week or so, hoping you'll stop back for the next version! Stunning. My favorite yet from you and that's a hard call to make!